Many organizations today have determined the core values that they post up on their websites, include in their employee handbooks, and post around the workplace. The question is, is it just window dressing to keep up with everyone else doing the same, or are these values really a meaningful part of the leadership and culture of the firm? In speaking with people at all levels of many organizations, both in for and non-profits, my experience is that too often the values are not as alive, impactful and meaningful as people would hope. The best laid plans and early activities give way to ‘life-as-usual’ and over time values take more and more a backseat. I think the main reason for the lack of values being fully integrated is that living by values, both personally and professionally, is a very difficult thing to do. What most people don’t realize is, you must make a conscious decision to take time identifying core values, determining their meaning, having lots of conversations about how to apply them in a myriad of scenarios, and then making a declaration, a commitment, to actually live them. In an organization a few extra steps are further required to get all employees informed and on-board. Then the real effort comes as you keep your awareness open regarding the values, on a moment-by-moment, day-by-day basis that also requires a similar level of commitment by all involved in order for you to be a ‘values-based company’. Whew … no wonder values drift in most workplaces … the new effort is just much more than originally expected. On top of all this, the real challenge in maintaining the values comes in holding oneself and others accountable to the values when tough situations, sticky people-issues and big problems occur. In those instances we most often get emotionally triggered and forget or angrily toss the values aside. If we are a leader and ignore or walk-over a value, and other employees witness that occurrence, and nothing happens afterward to address it or clean it up, then you might as well toss the whole values effort out the window. Employees will chalk it up to just another ‘management fad’ and diminish the entire values initiative. When people see incongruence between what we say we hold true and our behaviors, then you create an even worse situation than prior, and employees lose trust, confidence and respect. – Takes total commitment from the very top of the organization, all the way through the entire management system. – Takes lots of open dialog to bring as many people into the values conversations. – Requires people to be open, vulnerable, honest and heard. – Requires everyone to be open to changing their thoughts and behaviors. – Has an on-going process all in itself to ensure it stays alive and provides the compass and glue for people and teams to make the best decisions possible. – Requires that you have a way for people to highlight in present-time when values are not upheld, and that an agreed way to resolve the breach and get back on track has been established and followed. – Takes time, since it is a never-ending series of daily commitments. – Does the CEO (top decision-maker) live, speak and walk the values in their everyday dealings with employees, customers, vendors, investors, the environment and communities? – Do the top leaders live, speak and walk the values in their everyday dealings with employees, customers, vendors, investors, the environment and communities? – Do all the managers, supervisors and lead-personnel live, speak and walk the values in their everyday dealings with employees, customers, vendors, investors, the environment and communities? – To what degree do all the employees of the organization know, understand, refer-to, call-out, and help each other live and work by the values? – To what degree are the values a part of every employee’s performance review and expectations? – Are the values mentioned at every meeting, especially when decisions are to be made? – Are values mentioned and tapped when conflicts arise and people come together to find resolution? – Have all employees been trained in what the values mean and how the leadership intends to utilize them? – Do your employees feel safe, protected and trust enough to ‘call-out’ to a co-worker, and even those in management/leadership positions, when they witness a breech in one of your values? – If a breach of a value seems to be the best decision at that moment, how transparent, responsible and accountable is the management person(s) making the call? – When was the last time you had a conversation about the validity of your values? Made any changes, enhancements to them? Added any new ones? – On a scale of 1-10, how do think employees feel that they, and others, live and work by the values? 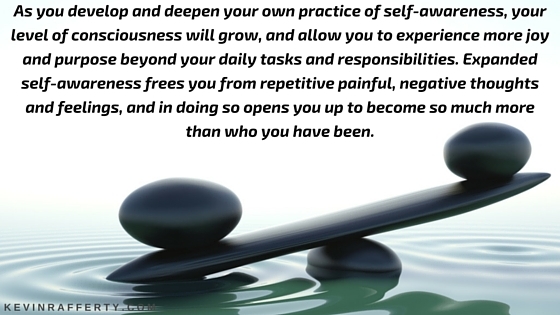 – On a scale of 1-10, how do you feel you live and work by your values? Living and leading by values isn’t easy, but it will lead you toward living a life of full of passion, purpose, prosperity and peace of mind like you have never known. 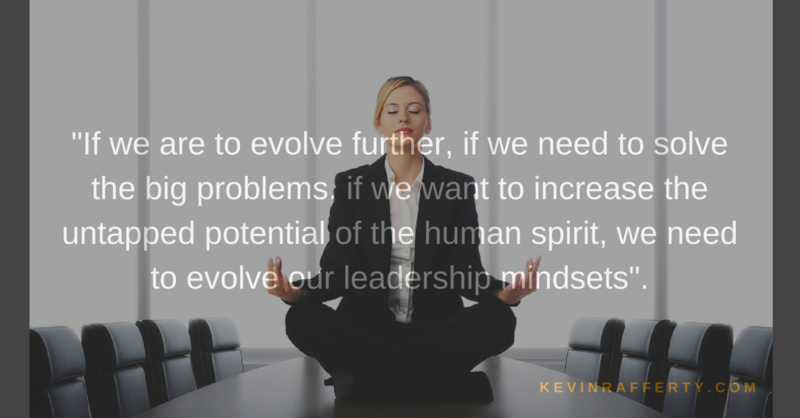 Are you really ready to live a values-based life, and be a values-based leader? 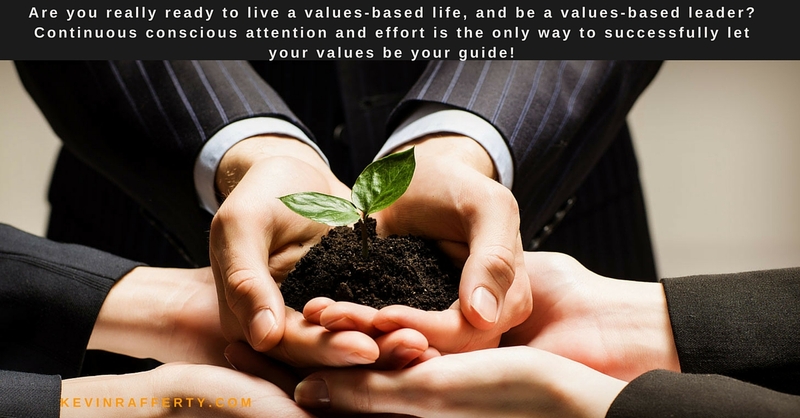 Continuous conscious attention and effort is the only way to successfully let your values be your guide!